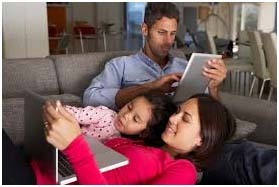 Statistics and facts on Internet Usage among Hispanics in the U.S.
An overwhelming 80 percent of Hispanic internet users are connected to some form of social networking, clocking in more time spent on social media per user than any other demographic group surveyed in the United States. Of the preferred social networking sites, Facebook unsurprisingly claims the top spot as the most popular social media among Hispanics, and recent data shows that the largest amount of Hispanic users navigate and communicate on these platforms bilingually, rather than tending toward either Spanish or English. Hispanic cultural values are reflected in how Hispanics use and consume the internet. Surveys reveal that family, health, and food are among the most-searched categories,all of which tend to be integral and important parts of Hispanic culture in the United States. The internet, in turn, affects Hispanic culture as well; the majority of Latinas admit to the influence of online lifestyle and product information in their everyday lives.